Tanya Denise Tucker (born October 10, 1958, in Seminole, Texas) is an American female country music artist who had her first hit, "Delta Dawn", in 1972 at the age of 13. Over the succeeding decades, Tucker became one of the few child performers to mature into adulthood without losing her audience, and during the course of her career, she notched a streak of top-10 and top-40 hits. 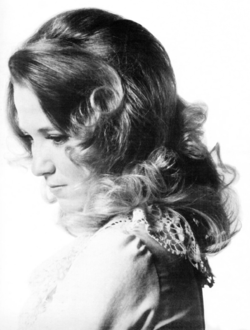 She has had several successful albums, several Country Music Association award nominations, and hit songs such as 1973's "What's Your Mama's Name?" and "Blood Red and Goin' Down", 1975's "Lizzie and the Rainman", and 1988's "Strong Enough to Bend". Among these hits was "Lizzie and the Rainman", which became a number-one country hit and also became Tucker's only top-40 pop music hit, peaking at number 37. It also peaked among the top 10 on the adult contemporary charts at the time. Tucker has a string of top-10 country hits under MCA between 1975 and 1978, including "San Antonio Stroll", "Here's Some Love", and "It's a Cowboy-Lovin Night". Two songs from the album became hits, "Texas (When I Die)" and "I'm a Singer, You're the Song". The biggest hit from the album was "Texas (When I Die)", which reached number five on the country charts, and also peaking in the bottom of the pop charts at number 70. Her music was now more country pop-styled and up-tempo, but this material made Tucker popular again. Between 1988 and 1989, Tucker enjoyed one of her most popular years on the charts, racking up eight country top-10 hits in a row. Her albums around this time were also achieving "Gold" certifications by the RIAA, after selling 500,000 copies. A Greatest Hits album followed in 1989, releasing a top-five hit to the country charts that year from the album called My Arms Stay Open All Night, which peaked at number two. By the 1990s, Tucker was a 20-year veteran in country music, though she was only in her mid-30s. In 1994, "Hangin' On" was her last top-five hit, as well as her last top-10 hit for a while. That year, she performed at the half-time show at Super Bowl XXVIII. In 1996, she was one of the top-10 most-played artists of the year, and that time Capitol Records' biggest signed female artist. In 1997, she returned to the top 10 on the country charts for the last time with the hit, "Little Things", which peaked at number nine. That year she was inducted into the Texas Country Music Hall of Fame. 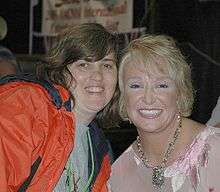 Tanya Tucker (right) at the 2005 CMA Music Festival. 1993 Academy of Country Music Awards Video of the Year; "Two Sparrows In a Hurricane"
↑ Dickerson, James L. (April 1988). "Good Friends Make the Best Records." Nine-O-One Network Magazine, pp. 32-35. Wikimedia Commons has media related to Tanya Tucker.